Grassroots mental health campaign Mindapples recently announced a major investment from a private charitable trust to scale up its services. Mental health issues cost the UK £110 billion each year, but we can each do more to take care of our minds, the Mindapples campaign argues. Founded by a group of campaigners in 2008, Mindapples asks everyone a simple question, “what’s the 5-a-day for your mind”, inviting people to choose five simple daily activities – or ‘mindapples’ – that work for them. Over 10,000 people have already shared their 5-a-days, including celebrities like Jo Brand, Keith Allen, Stephen Fry, Alastair Campbell and Alain de Botton, and the campaign has attracted praise from leading health professionals and policy experts. The Mindapples volunteers, or ‘gardeners’ as they call themselves, spread their positive messages at pop-ups and festivals including Secret Garden Party and the Thames Festival. 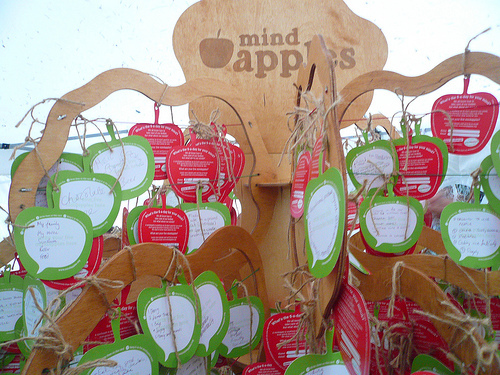 People share their 5-a-days online, at mindapples.org, and also at events, writing their mindapples on apple-shaped cards and hanging them on ‘mindapples trees’ which the campaigners erected around the UK in 2011. Popular ‘mindapples’ include exercise, good food and sleeping well, but also more unusual responses like “take my dog dancing”, “talk to old ladies at bus stops” and “pet something furry”. In these cash-strapped times, most of the ways people take care of their minds are also low-cost or free. The current gloomy economic outlook and growing social unrest are making positive messages like Mindapples more important than ever. Mindapples will use this funding to scale up its services to workplaces and healthcare providers, which support employees and patients to take better care of their minds. They will continue to work with large businesses in financial services, utilities and media to promote employee health and wellbeing, and with the Mental Health Promotion Team at South London and Maudsley NHS Foundation Trust to incorporate their “5-a-day for your mind” approach into public health and primary care services in London.